Try the Sample Speed Match Game Now! 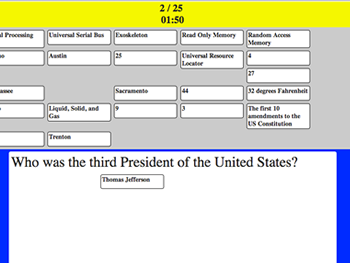 The Speed Match Review Game allows you to create a matching quiz with drag and drop functionality. This tool is a fun and interactive way to review content in your classroom, meeting, conference, or other group setting, particularly if you have an interactive whiteboard or tablets in your classroom!